Trout are actually quite different from many other smaller fish. Unlike a lot of other fish, trout have excellent eyesight, and generally, they live in clear, quickly moving waters, not murky, stagnant areas. Firstly, trout are freshwater fish, and generally don’t grow to massive sizes. Coupled with their good eyesight and the fact that they spook easily, this means that braided superlines are not only excessively strong and stiff for use while trout fishing – their high visibility will likely scare trout away. So while you may prefer superlines for most other fishing applications – and who wouldn’t, with their great durability and small diameter – they are not appropriate for trout fishing. If we’re talking about the “Big Three” of fishing lines, it’s clear we only have two choices left. Monofilament and fluorocarbon lines. Let’s take a look at the advantages and disadvantages of both types of lines, the applications that are better for each, and finish off with some product recommendations so that you can stop reading about trout fishing, and get out there for yourself. So What's Better For Trout Fishing? Monofilament has a great water refraction index, making it quite hard to see in the water. This is great for trout, as they are easily spooked, and can spot fishing lines quite easily if they’re too thick or colored. You’ll want a line that blends in well with the water, and monofilament can do that. Fluorocarbon has has a reputation for being a little touchy when it comes to durability, and often developing “weak points” if abrasions happen multiple times in the same areas of line. Monofilament is very durable, and the tough nylon doesn’t have any problem with abrasion. Monofilament is quite stretchy – often up to 30% stretch – and this means that it can handle harsh impacts and bites quite well, and is more forgiving for beginner anglers than comparable fluorocarbon line. Despite advances in fluorocarbon technology and “soft” fluorocarbons, monofilament is still generally easier to knot, use, and work with, making it a great choice if you don’t like struggling to knot tougher line. Flotation can be great for topwater fishing for trout, and for mid-water suspension rigs, or other precision water-column fishing. Nylon monofilament is very tough, and resists abrasion for high durability. Nylon monofilament is the most inexpensive line on the market, and easily the most popular, which can be a factor if cost is an issue while shopping for trout line. Nylon monofilament tends to have line memory problems – it will eventually snag, snarl, and become unusable. For higher quality mono, this can often take up to a year, though you may see more looping while casting and other issues far before that. While monofilament is more durable than most fluorocarbon lines, it’s also quite a bit thicker at higher lb test weights, making it a bit harder to manage in great lengths on reels, and making it harder to conceal in the water. The great stretch of monofilament is a double-edged sword – while it means great shock resistance and forgiveness when hooking fish, it reduces the overall sensitivity of the line, which can be a big problem when fishing for small, light trout that often strike tentatively. While some monofilament lines are coated with water-resistant materials, inexpensive mono can sometimes soak up water, which makes it harder to cast and work with, and reduces its strength. The refractive index of fluorocarbon in water is identical to water – it is absolutely invisible to fish, and this is especially desirable when hunting sharp-eyed and easily spookable trout in clear water. The less they see of your line, and the more of the lure, the better. Not only is fluorocarbon line less visible in the water, it maintains a thinner diameter at higher test weights than monofilament does, despite monofilament durability. Combined with its low visibility, this means that trout will have a very hard time seeing your line, even when you’re using a 20lb+ test line. Fluorocarbon has a good combination of sensitivity and stretch – while it’s not as stretchy as nylon, fluorocarbon line offers some forgiveness and shock absorption, and also has a much more tight and sensitive line feel, which is very handy when going after smaller freshwater trout. If you’re looking to do some deep water crankbaiting, jigging, or other deep water fishing for trout, you’ll want fluoro line. The natural sinking action of fluorocarbon line helps keep your lures as deep as possible for longer, giving you more opportunities to snag your prey. Unlike monofilament line, fluorocarbon has no waterlogging problems – the fluorocarbon material repels water, and will never get soaked or lose strength due to prolonged immersion in the water. Fluorocarbon line can sometimes be harder to work with, especially in heavier test weights when the thickness increases. This can make it inappropriate for some spinning reels that require a thin, soft line like a monofilament, though generally just about all baitcasting reel will be able to handle fluorocarbon. Fluorocarbon has high line memory – even higher, in some cases, than monofilament. Combined with its more stiff material, this can make dealing with fluorocarbon quite tough, and it’s recommended that you change out your fluorocarbon line as soon as you notice line looping, snagging, or other signs of wear and line memory. Fluorocarbon has problems with developing weak spots when abrasions happen to the same areas frequently, which can lead to lines snapping and decreases the overall longevity of the line. Well, there’s no clear winner. If you forced us to choose at gunpoint, we’d say that fluorocarbons are generally more popular for a reason – eagle-eyed trout have a harder time seeing them, and you can use a lower diameter line to avoid further spooking your quarry. But monofilament has its place too – inexpensive and easy to use, it’s a great option for slightly murkier waters, and performs just as ably as fluorocarbon – better, if you’re using it for topwater fishing. So in the end, the decision is up to you. Let’s take a look at some products from both of these categories of line now. Seaguar is known for manufacturing some of the very best fluorocarbon on the market. They manufacture their own fluorocarbon polymers in-house, meaning they have total control over quality and blends of polymers, leading to a very consistent and great product. This specific fluoro line was crafted with softness and pliability in mind, so it’s quite flexible compared to some other fluorocarbon lines. In addition, it’s chemical resistant, UV resistant, and water-resistant, offering great durability and abrasion resistance, with a slight stretch giving it high-impact durability. Seaguar is known for quality, so if you need some fluorocarbon line for trout fishing, you won’t be let down by this product. 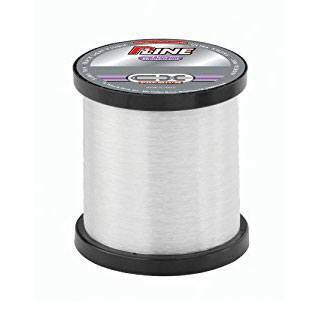 A mix of both monofilament and fluorocarbon, this line by P-Line combines the best of both worlds. The refraction profile of the fluorocarbon and monofilament combine for a nearly invisible line, and the fluorocarbon also helps repel water, making this monofilament line totally waterproof, unlike some others on the market. This line also has fewer line memory issues than pure fluorocarbon line, and it’s easy to knot, unlike standard fluoro which can take special knots and a lot of work to get the perfect hold. In addition, the fluorocarbon coating is super smooth, meaning your line will fly through your rod guides quickly and easily for a superior cast. This line is a great blend of the positive characteristics of both fluoro and monofilament while minimizing some of the negative characteristics of each, making it a great choice for fishing trout. 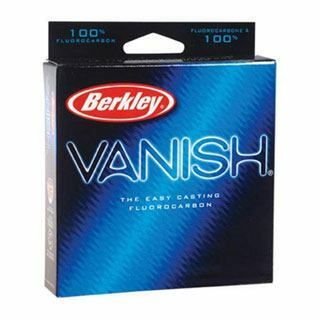 Berkley Vanish Fluorocarbon is known mainly for its small diameter design. Which combines with a transparent water-refraction profile to create a nearly invisible line underwater – perfect for luring in wary trout. It’s also not as stiff as other fluorocarbon offerings, making it easier to knot – though you still may need to master a Palomar knot or use some super glue if you’re looking for a very tight hold on a hook or lure. Its small diameter belies its impressive strength – some users claim that Berkley Vanish can easily handle fish twice its rated test lb, making it quite impressive indeed. Copolymer Monofilament is still technically a nylon monofilament, but instead of just one nylon polymer, copolymer lines use two or more, in an effort to create a more high quality, durable product. The copolymer design allows this line to use a smaller diameter while maintaining a high test weight, which is great when fishing for trout – the thinner the better, as they’re less likely to see your line and get spooked. It’s also got less stretch than a standard monofilament line, making it better for detecting small bites. This copolymer line also has fewer memory problems than lower quality monofilaments, making it a great choice if you’re looking for a more durable, long-lived line. This offering from P-Line is another interesting product, combining top-quality copolymer monofilament with a fluorocarbon coating for a truly outstanding line. The unique design and fluorocarbon coating leads to a line with 30% less stretch than other comparable monofilament lines and an ultra-thin, strong design that also maintains a low line memory. It combines the flexibility and ease-of-use of monofilament, high quality of copolymer mono, and the refractive quality and casting smoothness of fluorocarbon in one convenient package, and in the 1000 yard spool, it’s quite a deal. If you’re looking for some incredibly versatile line and aren’t sold on pure fluoro or mono lines, this copolymer, fluoro coated line is your best bet. In the end, the style of line you use is up to you. Both monofilaments and fluorocarbon lines – and all the combinations in between – can catch trout, and every individual angler has his or her own preferences about what’s best. Just bear in mind the advantages and disadvantages of each type of line, and you’re sure to make the right decision. If you’re not sure what you’ll like, try getting a couple different types of line, and using them all. After you’ve fished with each for a little while, you’ll have a much better idea of what best fits your personal fishing style and preferred techniques.